The bald eagle, red-tailed hawk, wild turkey, and sage grouse are among just a few of the native species that flourish in the Ranch’s meadows and timbered high country. DESCRIPTION: Distinguished by a white head and white tail feathers, bald eagles are powerful, brown birds that may weigh 14 pounds and have a wingspan of 8 feet. Male eagles are smaller, weighing as much as 10 pounds and have a wingspan of 6 feet. Sometimes confused with Golden Eagles, Bald Eagles are mostly dark brown until they are four to five years old and acquire their characteristic coloring. 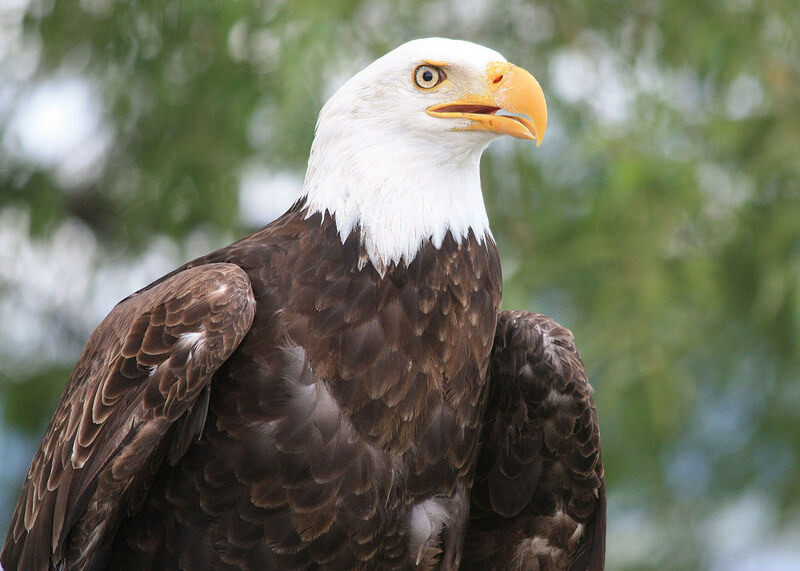 HABITAT: Bald Eagles live near rivers, lakes, and marshes where they can find fish, their staple food. FYI: The bald eagle builds the largest nest of any North American bird and the largest tree nests ever recorded for any animal species, up to 13' deep, 8.2' wide, and 2200 pounds in weight. DESCRIPTION: One of North America’s most widespread and common hawks, the red-tailed hawk is easily identified by the red upper surface of its broad tail. Most red-tailed hawks have rich brown upperparts and pale underparts, with a streaked belly and a dark bar on the underside of the wing. Though their wingspan may be as much as 4½ feet, redtailed hawks are amazingly lightweight. A large adult may weigh just 3½ pounds. HABITAT: The red-tailed hawk is typically associated with open areas which are interspersed with woodland, and is generally absent from large expanses of treeless terrain and from dense forest. FYI: The oldest known red-tailed hawk lived to age 28 years, 10 months. DESCRIPTION: The wild relative of one of only two domesticated birds to have originated in North America. 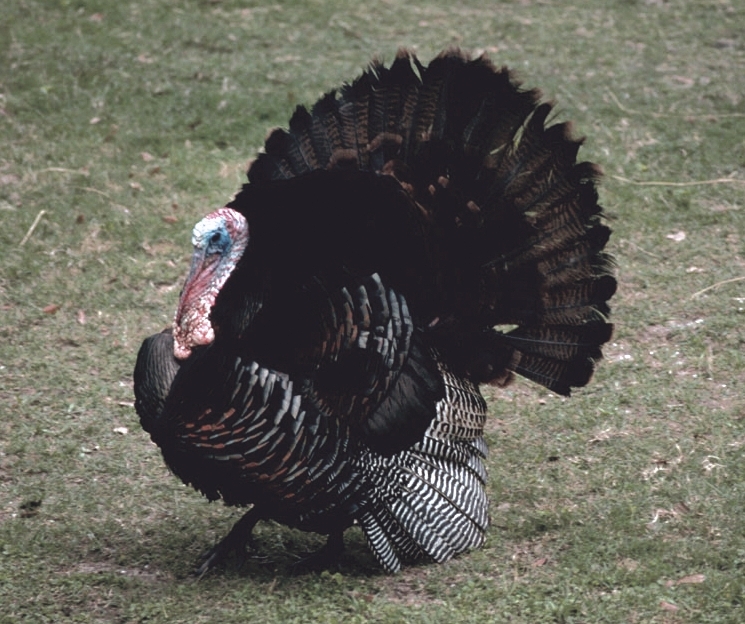 Its hefty size, characteristic plumage and social behaviour are particularly admired in the United States, and, as a result, the wild turkey has long been a popular symbol of American wildlife. The wild turkey has long, powerful legs, a long neck, and a large, fan-shaped tail. HABITAT: Wild turkeys are highly adaptable, able to survive in warm environments as well as those regularly blanketed with snow. The one necessity for all wild turkey populations is the presence of mature or nearly mature forests. Large trees provide a significant food source and safe roosting sites above ground. FYI: An adult turkey has 5,000 to 6,000 feathers on its body. DESCRIPTION: greater sage-grouse have a long, pointed tail and legs with feathers to the toes. The adult male has a yellow patch over each eye, is grayish on top with a white breast, and has a dark brown throat and a black belly; two yellowish sacs on the neck are inflated during courtship display. The adult female is mottled gray-brown with a light brown throat and dark belly. HABITAT: Greater sage-grouse are obligate residents of the sagebrush ecosystem, usually inhabiting sagebrush-grassland or juniper sagebrush-grassland communities. Meadows surrounded by sagebrush may be used as feeding grounds. FYI: Sage-grouse populations vary greatly over time, but the number of male birds documented in 2015 has rebounded significantly from a recent low in 2013, allowing the US Fish & Wildlife Service to remove the bird from endangered species protection status.